The books can be ordered from Amazon UK, or from Waterstones, or Blackwell’s, or Foyles and Barnes & Noble. They can also be ordered from good independent booksellers, including Red Lion Books, Colchester. There is little time in which to find who is responsible. How far will they go? Should they be stopped? Can they be stopped? If you were the only ones who could save the world, where would you begin? Who would you trust? The original idea for the trilogy came from walking in the woods with my children and discovering treasure beneath the roots of trees felled by a storm. This led to the idea of the prediction of an impending global catastrophe and the resulting consequences. The Invisible College has taken ten years to develop and complete. I spent much time on research of sources that give credibility to the story as an interpretation of historic legends, from the Ancient Mysteries, through the Book of Revelation and Norse Myths. During my research, I discovered books describing historical documents, myths and legends that appear to support the existence of the prophecy and justify the hypothesis. Adult Fiction, Teenage Fiction, Literary Fiction, Adventure, Mystery, Dystopia, Coming of Age. The unique feature is the truly original world-changing event and conspiracy, relevant to a global audience. The book can be read as an adventure novel, with or without awareness of the literary and historical allusions. It will appeal to adults and young adults from 11 years. A mystery story and an adventure, with major themes of conspiracy, a hidden community, ancient myths and mysteries, the quest for hidden knowledge and treasure, moral values and freedom of choice. 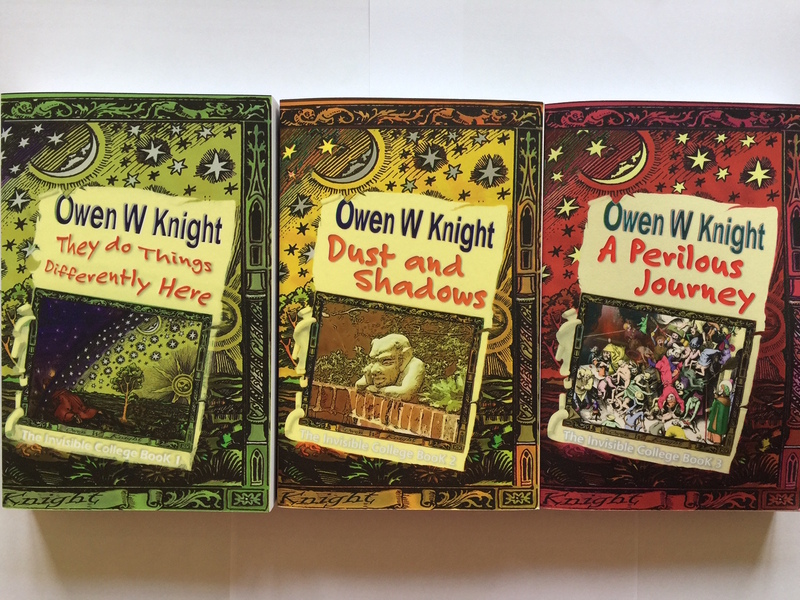 The trilogy can be read simply as a conspiracy novel, or enjoyed for the hints of paranormal possibilities. The trilogy will make an excellent film adaption. Book 1. Discovery of the isolation of the village and the control exerted over its inhabitants. Book 2. Revelation of the prophecy of a world-changing event, its nature and scale, and the connection to the family. Book 3. The battle to save the planet and the human race. The trilogy begins by emphasising the outward ordinariness of the village. The pace accelerates as the mystery is uncovered. The style moves from narrative towards dialogue, then action. Passages of formal and Gothic writing reflect the community’s isolation and a growing awareness that all is not normal. An extract can be found here.